I have my favourite Christmas objects that come out of storage each year, there’s something quite delightful about reacquainting yourself with the memories of last Christmas and before. But first, we headed to Adairs to get the jump on their Christmas collection. In true Adairs style they have decorations for all and every home, wether you’re after classic, casual or colourful. We started with lots of faux foliage (5 strands to be specific!) this makes the tree lush and plump. Next we added lights. I love the lumiere festive string lights because they’re easy to manouever between branches and they give off a crisp bright light. When you’re taking a classic approach, the colour scheme of white and gold is a winner, providing contrast with the green of the tree. Get your pop with touches of red. 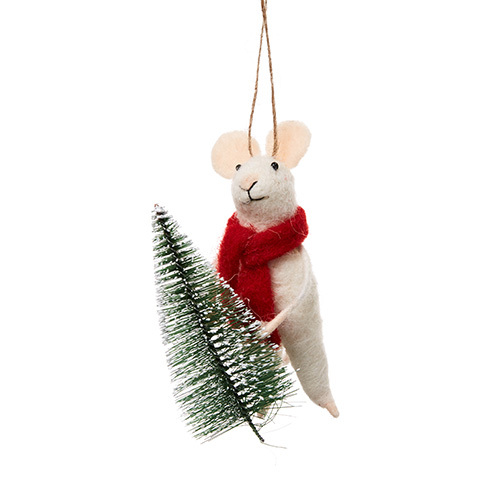 We chose traditional christmassy shapes for our decorations - baubles, bells, and my favourite - the felted friends - their hand-made nature gives the tree a story and sense of humour. Choose a selection of decorations that cover different sizes and shapes - so you have options for filling all the gaps - but keep to select few designs - five or six designs, en-masse, will provide the biggest impact. Go a step further and paint yourself a classic, Christmas-coloured, backdrop. We used Resene Family Tree - a rich green - and Resene Candy Floss - an explosive hot red. For a more informal approach to your Christmas styling choose a portable tree, one that can sit on the table or a shelf. Go crazy with your colours. Our pick > shades of pink and turquoise - the perfect match for our backdrop of Resene Yowza - a bold, vibrant teal - and Resene Pink Ribbon. Choose tactile textures like wool and wood to create a more relaxed feel. Choose a colour and style theme that fits with your home and lifestyle.